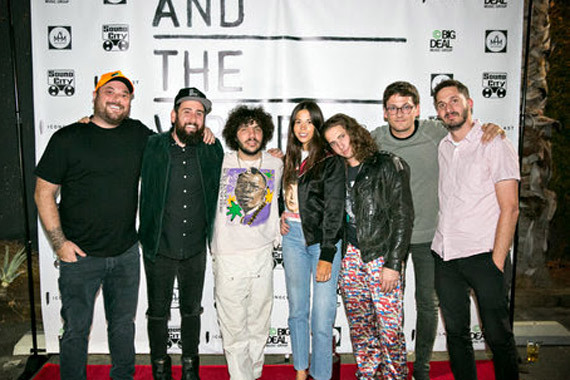 Pictured at the podcast’s season 2 kick-off party at Sound City Studio in Van Nuys, Calif. (L-R): J Kash (songwriter), Ross Golan (host and producer), Benny Blanco (songwriter), Ali Tamposi (songwriter), Andrew Watt (songwriter), Joe London (producer), David Silberstein (Mega House Music). The podcast series And The Writer Is… is planning a special country music week featuring interviews with Thomas Rhett, Nicolle Galyon, Rhett Akins, Ashley Gorley and Zach Crowell​​. The episodes will debut beginning Nov. 6, to coincide with CMA Awards week. This is the second season of the popular podcast hosted by Ross Golan, a multiplatinum songwriter with credits including “My House” (Flo Rida), “Same Old Love” (Selena Gomez) and “Dangerous Woman” (Ariana Grande). He and co-producer Joe London started the podcast to shine a light on the creative process, inspirations and pitfalls of songwriters. 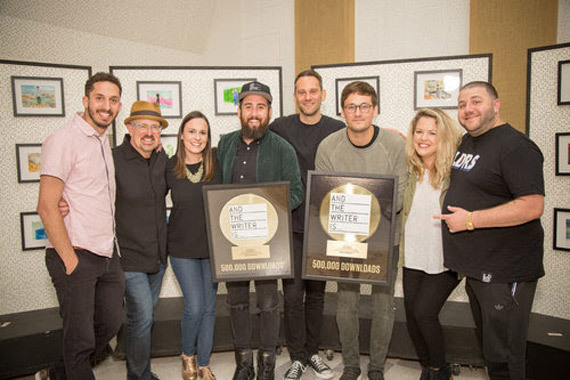 Big Deal Music and Mega House Music sponsor the series, which since launching in late January has received over 535,000 downloads, putting it in the top 5 percent of all podcasts. Golan has plenty of Nashville connections, including his first No. 1 as a songwriter on Lady Antebellum’s “Compass.” He is a frequent collaborator with Keith Urban, and last season featured Luke Laird on the series. Golan recently spoke to MusicRow about the importance of giving a voice to the writers behind the hits. What was the mission when you started this podcast? I want people to get to know these songwriters. All the guests on the show say that after their episode airs, fans reach out to thank them. Fans say they can relate to certain things and understand things they didn’t before. The whole idea is putting a face to the craft. That is the most satisfying part. Who are the people who decide to sell air for a living and also take care of their families? We forewent having stable income with benefits to pursue this. We are selling something intangible in an era of no CDs or albums. We are selling concepts and emotion, lyric and melody. Who are the people with the drive to make this their living? I think the assumption is that songs grow on trees. The assumption with really prolific writers is that they will always be successful, and that it comes to them very easily. But then you realize that Luke Laird, Ashley Gorley, Rhett Akins, all these great writers—their volume and consistency of songs is unbelievable. They must challenge themselves constantly in order to be relevant. They are studying the art form. It’s so hard to write a hit song. That’s why sitting down and talking to them, you figure out they went to school. They struggled. They didn’t start out as songwriter of the year. I think that when you are younger, you think hit songwriters were born that way. We want to explain to aspiring writers that it didn’t come easy to any of the professional writers. They all struggled. Some went through rehab, or bankruptcy. Was there a struggle you overcame in your career? At that point in my life, I had no other option than to go 100 percent into songwriting. I had previously been signed as an artist, and fortunately about the same time as I lost the condo, I had cuts by Demi Lovato, CeeLo Green, and Maroon 5. So I was able to get a publishing deal and move forward with my life. Warner/Chappell opened a lot of doors for me. Through the process I went from giving my place back to the bank, to BMI Songwriter of the Year in about 8 years. I’m pretty proud of the fact that it didn’t come easy. What is Big Deal’s involvement with the podcast? Big Deal has been good friends of mine for a long time. They publish Joe London. Big Deal has been amazing and this is something they are doing for the songwriting and publishing community to help spread the word that songwriters are people too. In the last year they’ve had “Die A Happy Man,” “Slow Hands” and multiple No. 1s in multiple genres. Big Deal, Mega House and Joe and I are so appreciative of people willing to help spread the word. We are doing this solely to give a voice to the people who work so hard behind the scenes. It’s not about me. It’s about the guests on the show. Has word-of-mouth among music fans driven the popularity of the podcast? Absolutely, yes. And a lot of schools are using it as part of their curriculum, which has been fascinating. The students are committed to learning from these writers. I always wanted to be a songwriter, so I wish this information had been available when I was in school. I think this is a really easy way to communicate what we do. This is an opportunity for students to learn, colleagues to learn about their co-writers, record labels to understand which writers write best with what kind of artists, and so the streaming services can see these are humans. What can we look forward to on Country music week? We’ll have Thomas Rhett, Rhett Akins, Ashley Gorley, Nicolle Galyon, and Zach Crowell. Thomas’s story is great and what he’s doing with his family is wonderful. And Rhett’s story of being a country star fascinating. Because ultimately, what he wanted was to be a songwriter. Ashley Gorley is setting all kinds of records, but he’s also one of the best fathers and husbands you’ll ever meet. And Nicolle is so savvy and she’s killing it at radio now. Also, on Oct. 30th we will have NMPA’s David Israelite on the podcast. I love the genre and the music, so I’m happy to shine a light on these writers.